Confex Makhalira and I at StoryRunners in Orlando. Over the past 12 years I’ve been privileged to teach Biblical and Systematic Theology in Malawi to over 600 students, now graduates, many who are leaders in various Christian groups. For example, four are Pastors at Presbyterian (CCAP) Churches in Lilongwe. The smallest of these churches has 1000 members and the largest has over 10,000 members. The Nkhoma Synod of the CCAP has over 2 million members but only 150 ordained ministers. While I’ve taught a dozen of these Nkhoma Synod Pastors, that is only 1 per year. The vast majority of the preaching and teaching in the Nkhoma Synod, and many other African churches, is done by untrained laypersons. How do we empower the lay persons who doing the majority of the preaching and teaching? Learning Biblically accurate, orally reproducible stories. In Africa the gospel is usually propagated in ‘bits and pieces’ apart from the ‘Biblical Story’. The tendency has been to reduce the ‘gospel’ to a few propositions striped from its story. Most Africans learn their ‘identity, history and values’ through stories. When this ‘reductionist gospel’ is promoted among ‘oral learners’ the people remain more defined by their cultural stories than by the gospel of Jesus. If Africans are to have their identities, history and values defined by the gospel then the gospel in Africa will have to be rediscovered in the context of the Bible story. We believe the best way to do this is to teach Biblical Theology using the Bible’s own stories. This is why we recently attended the ‘Storyrunners School of Storying’ in Orlando. I participated in this weeklong training with Confex Makalira, the 2005 ABC valedictorian. As a student Confex preached at our Maula Prison Outreach for three years. He writes a weekly theological article in a Malawian newspaper and he has worked with us on a number of in-service trainings for Church Pastors. He is currently in seminary in the states and his emphasis is in Systematic Theology. Confex realizes that most Africans are ‘oral learners’ and that ‘Bible doctrine’ is better comprehended in the African context through the Bible’s own stories. The method of ‘Bible Storytelling’ we learned in Orlando has given us the tools to produce a set of 42 Bible stories in the indigenous languages of Malawi. These stories range from ‘Creation to New Creation’ and are designed to tell the overall Biblical Story that is fulfilled in Jesus. The training taught us a method of teaching stories that are Biblically accurate and orally reproducible. It has also given us a series of checks to help ensure these stories are true to the Bible. We plan to hold these same trainings in Malawi with Malawian Christians who can produce the same ‘story set’ in their own languages. http://www.storyrunners.org/. In order to teach Biblical Theology in the ‘Local Church’ to both Pastors and laypersons the Lord is leading us in a new direction. Some dear friends are currently building a Christian Conference Center in Malawi. In time we would move to staff housing they plan to build at the center. From there we would teach Pastors, Church leaders and Church groups Biblical and Systematic Theology through the Bible’s own stories. For now we will stay connected to the Malawian Church by helping launch a ‘School of Storying’ in Malawi that will eventually be lead entirely by indigenous leadership. 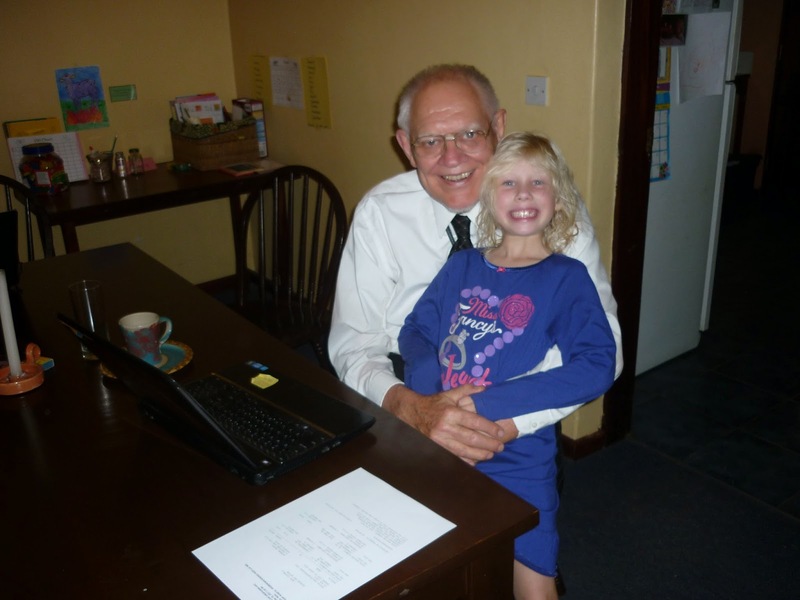 Dr. Krabbendam with our daughter Clara. Consequently, we are leaving the African Bible College to work through the Africa Christian Training Institute. ACTI is an officially recognized charitable organization that is committed to the church in Sub-Saharan Africa. ACTI was founded by Dr. Krabbendam, a highly respected Evangelist and Theologian who taught at Covenant College for 35 years (PCA). We have held a number of seminars and in-service trainings for Pastors in Malawi with Dr. Krabbendam over the years. The Africa Christian Training Institute has been training Christian leaders in Sub-Saharan Africa for over 25 years. It is an honor for us to work with them. We ask that you would prayerfully consider partnering with us to strengthen the African Church by teaching Biblical and Systematic Theology through the Bible’s own stories. This ministry is dependent upon the faithful prayers and generous financial support of individuals and churches like you.